Heavy rains are being predicted for the entire region the next two days, and emergency agencies are warning that may mean flash flooding. A flash-flood watch has been issued for the area, to be in effect Friday afternoon through Saturday afternoon. According to the National Weather Service, a stationary low pressure cell may bring torrential rains. Low pressure is going to develop over the Mid-Atlantic Friday and remain nearly stationary this weekend. This will have the potential to bring 3 inches or more of rain to the region through Saturday afternoon. Thunderstorms could cause locally higher rainfall amounts. Heavy rainfall may result in rapid rises in streams and creeks. This could quickly result in flooding… especially in low lying and poor drainage areas. The Washington Post’s Capital Weather Gang says this storm’s structure is similar to that of a winter storm. They say some pockets within the storm may see upward of 7 inches of rain. Move immediately to higher ground. Do not wait for instructions to move. Always stay away from floodwaters. If you must walk in water, walk where water is not moving; use a stick to check the ground. Keep your children inside and away from streams and creeks. Keep your vehicle parked in your garage or on the driveway away from low-lying areas and large drains. Stop and take an alternate route. The depth, current and condition of the road are all unknowns and can be deadly. If your vehicle stalls on a flooded road and water is rising, get out of the car, call 9-1-1 and move to higher ground. 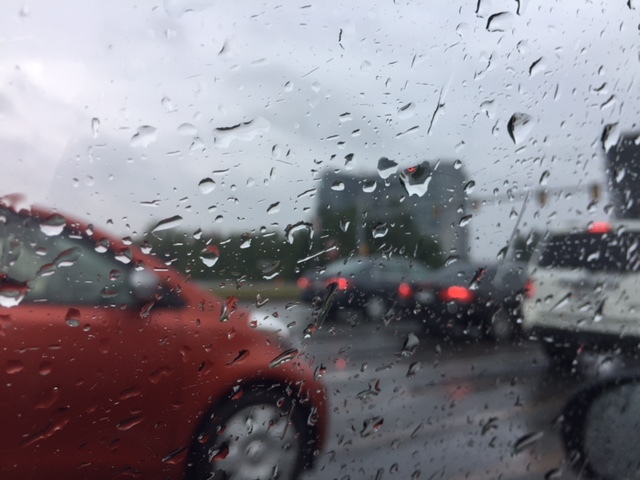 Be especially cautious during periods of limited visibility or nighttime when it is extremely difficult to see and judge conditions — state law requires headlights when wipers are on.